The 12 Hours of Sunlight was yesterday and I’m sure everyone who was there would agree– it’s nice to have that done. 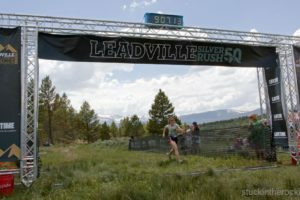 The 12 hour race requires skiers or boarders to ascend, on foot or skins, 1,500+ vertical feet up Sunlight Ski Area and then ski down and repeat, for half a day. It can be done as a solo, duo relay, or a four person “firedrill” team. 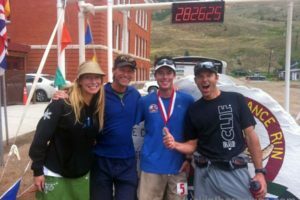 Christy and I decided to give the “Sunlight Endurance Challenge” a go, now in its second year in the 12-hour format, as a co-ed duo. 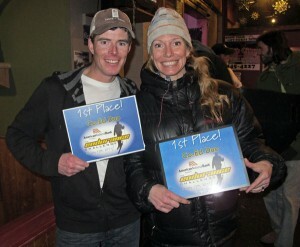 And though the overall field was relatively thin this year– there were only 24 different solo/teams registered and just 3 co-ed duos– the presence of our friends Adam Frisch and Lyndsay Meyer as one of the three in our category meant that despite the small number of competitors, we would likely have a real race on our hands. And that is exactly what it became, proof of which can be seen in the fact that in the end, after half a day and 20 laps completed by both of our teams, only 3 minutes separated us. 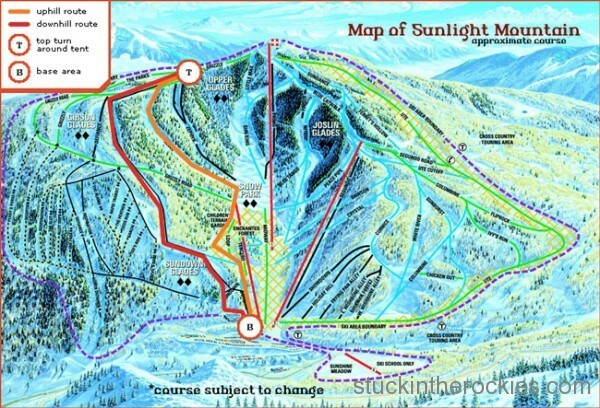 The Sunlight Ski area map with the marked course. 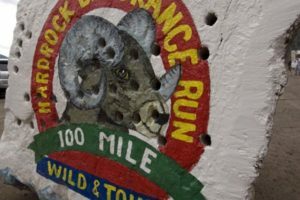 The website measures a full lap at 1,523 vertical feet. And as if a little friendly competition wasn’t enough motivation, the winning teams took home a cash prize, which for our category was $225, just about what Christy and I paid to register. So when the gun went off at 8am yesterday, in addition to having a good time, we were hoping to almost break even on the day. Not unexpectedly, Adam and Lyndsay had similar goals. It didn’t come easy. Our two teams are listed below. The splits chart. Adam lost his bib on Lap 7 so Lyndsay’s next lap time was for two. We both finished twenty. Adam and Lyndsay at the finish. 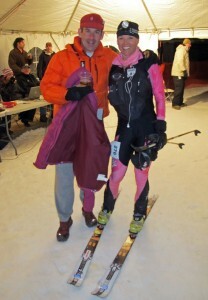 Fortunately for the boys, the girls had the last lap so we were able to change and grab a beer while the girls duked it out in the dark. The four of us, all friends, all fairly competitive and able to put in the effort when required, went at it all day. Adam and Lyndsay held a four to six minute lead though the entire first half but like anything of considerable duration, sometimes the real race doesn’t begin until nearer the end, which was the case here. Around the 7th lap I caught up to Adam and their lead was trimmed to even and then it was time to start digging deep, so-to-speak. 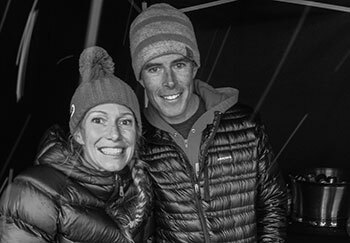 Without going into the details, Christy took off on her 10th lap, in the dark, and with a 6+ minute lead. Lyndsay, unwilling to give it anything less than her best, closed the lead considerably, but not enough to catch Christy, who skied into the finish 3 minutes in front. Three minutes. That’s not much. Ten seconds per transition(x 20 laps), one skin failure, ski crash, or any other small miscalculation could have easily changed the outcome. Awesome job to Adam, Lyndsay and Christy. The day was memorable and we all performed better than we had expected thanks to the increased competition resulting from us all being there. Maybe a double or nothing rematch next year? Congrats to Brian Johnson and Pete Gaston for taking the mens duo with 23 laps and to Billy Laird’s 2nd in the mens solo. That was a paltry three minutes after twelve hours, most of time we were behind. Christy and I are the ones who will likely need to be faster for this shorter day, but if you want to believe you’ll be behind I’ll take that mental advantage. Either way we’re looking forward to it, now if you could just spike Katy’s cookies this time you could have a real advantage.